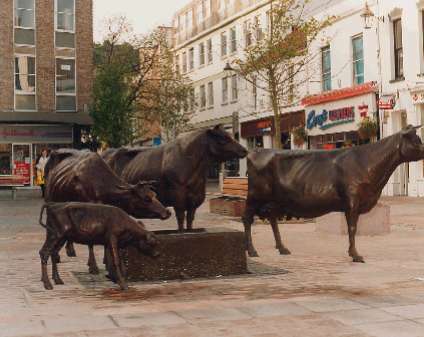 TheYear of the Jersey Cattle sculpture commission was an idea originally concieved by Aiden Smith OBE, who was resident on the Island of Jersey. He sought out the great and the good of Jersey and a committee was created to organize the project. A international search to find a suitable sculptor of the right calibre was made by the sculpture committee. A shortlist was made and John McKenna was selected from that shortlist to create the group sculpture. John McKenna spent many months working on the Island, modelling the clay originals of the animals, moving from farm to farm, seeking the best examples of the breed. International Jersey Cattle judges visited John to see the work in progress and advised himon the best features of the cattle to incorporate into the sculptures. The Year of the Jersey project is sited in St. Helier, capital of the Channel Island, Jersey. 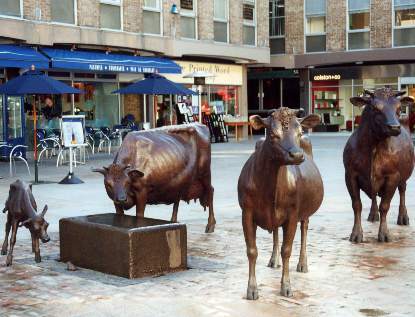 This large commission was for a group of Jersey cattle to be cast in bronze for a prominent site in the town centre in celebration of the world famous cattle breed. For John the sculpture project was a journey of discovery about a farm animal he had often taken for granted but by the end of the project after many months of observing the breed he realized how beautiful an animal bred to perfection could be. 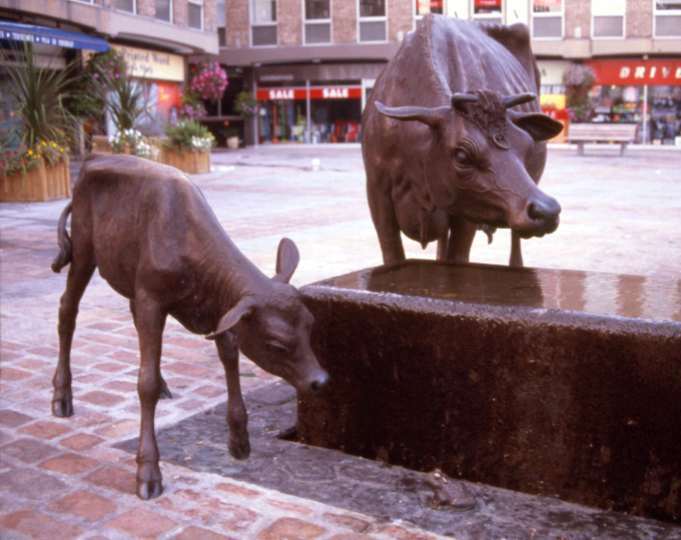 The bronze cattle sculpture celebrating this world renowned dairy cattle breed was installed during September 2001 and unveiled to a huge public crowd on the 29th September 2001. The sculpture was a huge suceess, thoroughly liked by the general public and cattle farmers alike. It is the most popular and photographed sculpture on the Island of Jersey and a huge tourist attraction. 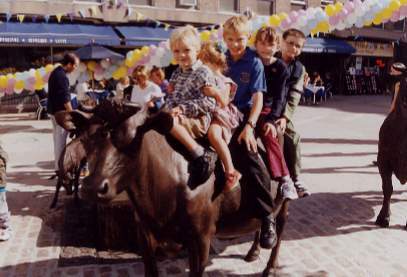 Above: the sculpture eternally popular with children isrobust enough to withstand frequent 'cattle riders'. 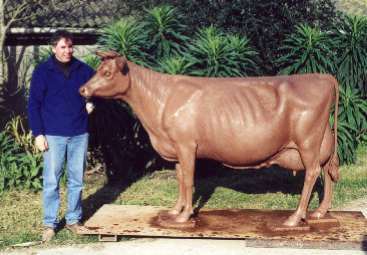 Left: John McKenna with the clay original of the lead cow of the group. 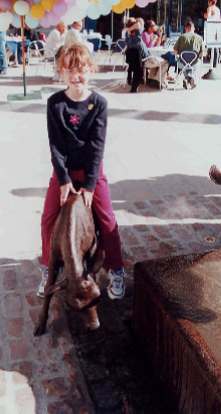 She was modelled at La Ferme, owned by Anne Perchard. The cows on this farm were world class stock, supreme Island champions. 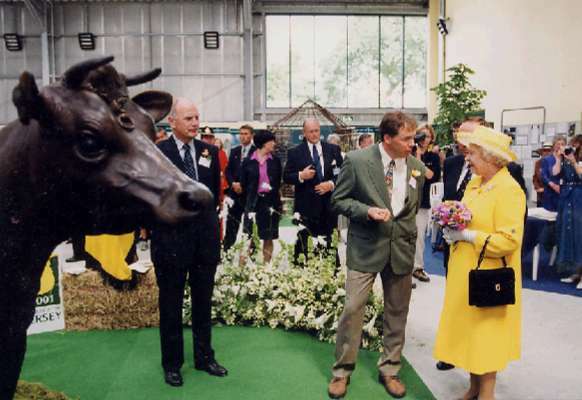 Below: Her Majesty Queen Elizabeth the second visited the Island and met with John McKenna at the Royal Jersey Agricultural & Horticultural showground. She was able to see work in progress on the Jersey cattle project - she has Jersey cattle on her own farm at Windsor. The Year of the Jersey project. This major artwork is sited in at West's Centre, St. Helier, capital of the Channel Island, Jersey. This large commission was for a group of Jersey cattle to be cast in bronze for a prominent site in the town centre in celebration of the world famous cattle breed. 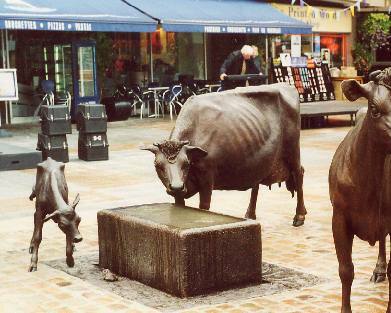 It consists of four lifesize bronze cattle around a drinking trough and is a highly representational observation of the breed, acting as a historical record of the physical form of the Island Jersey breed for future generations to come.